Tenaya Fire (37 46.091 x 119 34.641 – Mariposa Co., 7200’ El. 8/7). This wildfire began on the afternoon of September 7, 2015, and is being suppressed. 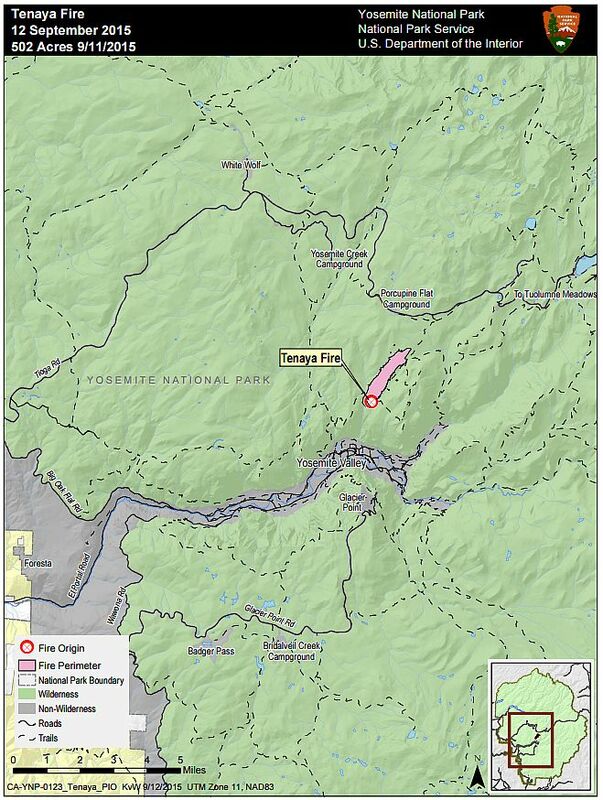 The fire is located along the Lehamite Creek Trail from the north rim of the Valley to the Tioga Road. The fire is at 415; the change is due to more accurate mapping by firefighters hiking the perimeter. The fire continues to creep through surface fuels and the understory of trees. No new spot fires have been found. The firefighter efforts at the heel or anchor point continue to hold as they make good progress along both flanks of the fire. There were no air tanker flights yesterday. Fire activities include light mop-up to hold and secure the fire line. 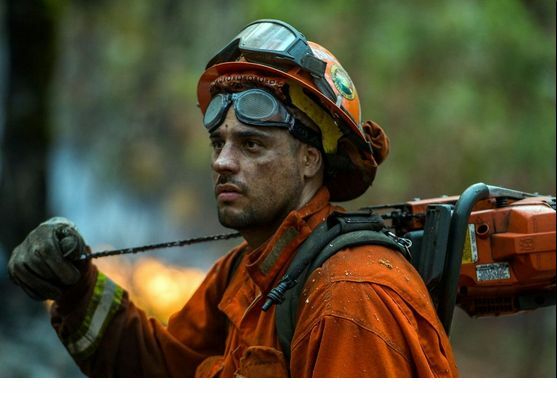 Firefighters are adhering to Minimum Impact Suppression Techniques (MIST). They are looking for opportunities to tie fire line into granite rock, trails, and other natural barriers with the least impacts to the environment, cultural and historical features. Snags (standing dead trees), which are safety hazards to firefighters by falling, are being preserved when possible. Yosemite Resource Advisors are assigned to the fire to assist firefighters. There are 162 firefighters committed - resource demobilization will continue over the next few days. Assisting organizations and cooperators include the US Forest Service, Bureau of Land Management, and other National Park Service resources. Risks include firefighter and visitor safety, and to the Tioga Road. A closure of the road would negatively affect the local communities that rely on park visitation, including the communities of Lee Vining, Mammoth Lakes, Groveland and Mariposa. There have been 2 minor injuries. There is no threat to structures. There is no estimated full containment and the cause is being investigated. Yosemite N.P. thanks all fire crews, engines, pilots and overhead who responded to the Tenaya Fire. A Safety Closure, issued by the park superintendent, is in place. It will remain in place until rescinded. All trails on the north rim of Yosemite Valley south of the Tioga Road and east of Yosemite Creek are closed. Trail blocks are in place – please adhere to their warnings of exclusion. Currently no roads are closed within the park. Cathedral Fire (37 51.078 x 119 25.120 – Tuolumne Co., 9400’El., 8/2). This is near the John Muir Trail to Cathedral Lakes. The perimeter is actively smoldering and creeping through lodgepole pine needles and logs and has good potential to grow until it hits natural barriers. The fire is 37 acres. Middle Fire (37 51.538 x 119 41.194 - Tuolumne Co., 8043’El., 7/27). It is west of White Wolf and south of the Middle Tuolumne River. It is at 71 acres. Yosemite Fire Crew 1 and Saguaro Wildland Fire Module are assigned to this fire. White Cascade (37 54.926 x 119 23.780 - Tuolumne Co, at 9000’ el., 7/3). 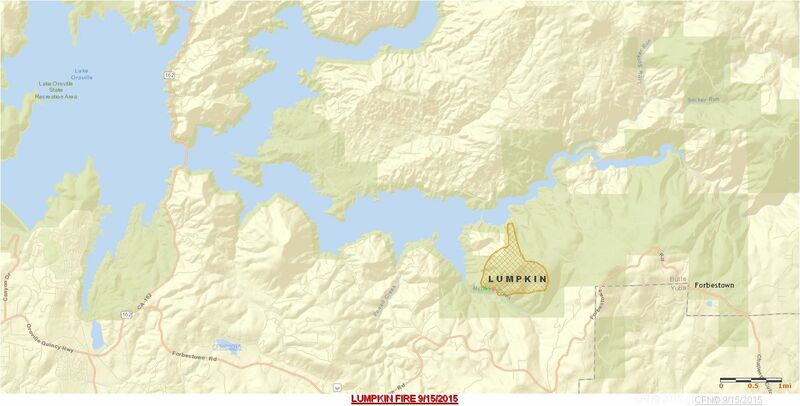 This remote fire is within Tuolumne Meadows and is approximately 30 acres. All visitors are urged to be diligent in any use of fire, including smoking. And be sure all fires are out! As with all fires, staff and visitor safety is of paramount importance. Each fire, regardless of size, is assessed for the appropriate course of action. For other air quality information: http://www.californiasmokeinfo.blogspot.com/ & http://airnow.gov/index.cfm? VALLEY 2 Fire is a separate start from the Valley IC but is being managed by same IC, due to limited resources. Valley 2 incident is now Division Golf (G) of the Valley incident. ADVISORY EVACUATIONS on Hwy 175 and all streets off of Hwy 175 from Cobb to the Dry Creek Cutoff. Hwy 29 X Bottle Rock, Hwy 29 X Hwy 175 (Kelseyville and Middletown), Hwy 29 X Red Hills, Hwy 29 X Loch Lomond. 09/12/2015 1930: Second staging area is now station 60. ICP will move to Station 60 in about 1 hour. 09/12/2015 1630: Per AA 'Extreme long range spotting' with multiple structures burning fire is being managed by Valley IC. Very limited resources available. Fire spotting throughout Boggs state forest and will impact hairpin hot springs in 2-3 hr, Harbin Hot Springs evacuated and the fire is on the ridge backing down into Harbin Hot Springs. AA states the fire will impact Downtown Middletown by nightfall. No divert on 6 ATs minimum due to continued life threat (evacuations in progress). 09/18/2015 0745: 73,700 acres, 40% contained. 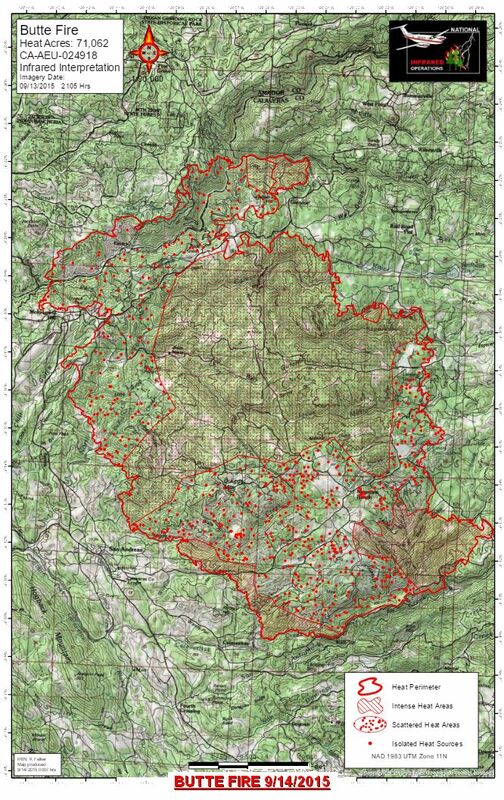 All but 1% of the 3,493 acre Boggs Demonstration State Forest was significantly damaged by the fire. Approximately 45 million board feet of timber was killed or damaged. SAFETY: Firefighter safety is a concern due to fatigue and rugged terrain. Driving hazards include downed power lines, narrow, unmarked, slick roads and increased civilian traffic. Hazards within the fire area include snags, hazard trees, poison oak, uneven and slippery ground from recent precipitation. Hazards adjacent to burned and damaged structures include exposure to toxic chemicals, contaminated materials, flammable gasses, and electrical. Hazards adjacent to the Geysers Geothermal Fields area include mine shafts, hydrogen sulfide and natural steam vents. 09/17/2015 0745: 73,700 acres, 35% contained. The Damage Inspection Teams are continuing to provide updated numbers regarding damaged and destroyed structures within the fire area. It is anticipated that these numbers will change as more information is gathered. 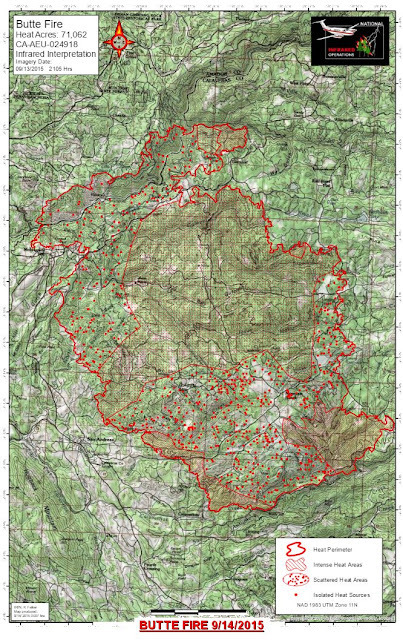 A major portion (75%) of the 3,493 acre Boggs Demonstration State Forest was significantly damaged by the fire. 09/16/2015 0745: 70,000 acres - 30% contained. 09/15/2015 1745 67,200 acres, 30% contained. Threatened (up to 72 hrs) Single Residences 7,650, Destroyed 585, The Damage Inspection Teams will be continuing their efforts today to provide updated numbers regarding damaged and destroyed structures within the fire area. It is expected that these numbers will change as more information is gathered. Lake County Road Closures: (open to Riviera and Riviera West residents only) -SR-29 at Live Oak -SR-29 at Main St. (Kelseyville) -SR-29 at SR-175 -SR-29 at SR-281 -SR-29 at SR-53 -Bottle Rock Rd. at Harrington Flat Rd. -SR-175 at Dry Creek cut-off (No non-emergency access) Napa County Road Closures: -Butts Canyon at Aetna Springs Rd. -SR-29 at Tubbs Ln. Sonoma County Road Closures: (open to residents only) -Ida Clayton Rd. at SR-128 -Geysers Rd. at Red Winery -Pine Flat Rd. at Red Winery -Geysers Rd at River Rd. EVACUATIONS: Lake County Mandatory Evacuation Order: -Butts Canyon Road to Napa County Line, including Berryessa Estates - Cobb - Seigler Canyon -Loch Lomond -Middletown -Point Lakeview to Soda Bay (SR-281) -Hidden Valley Lake -All residences on Bottle Rock Road, from Harrington Flat Road -All residences on SR-175, Cobb -All residences on SR-29 at SR-53 South to SR-29 at Tubbs Lane Napa County Mandatory Evacuation Order: -Berryessa Estates -Aetna Springs R/d west of Butts Canyon Rd. Evacuation Warning -Pope Valley north of Ink Grade Rd. 09/15/2015 0745 67,000 acres, 15% contained. Current Incident Threat Summary and Risk Information in 12-, 24-, 48-, and 72-hour timeframes: 12 hours: Threats to the communities of Middletown, Hidden Valley Lake, Cobb Mtn, Berryessa Estates, Twin Lakes, The Geysers. In addition, the communication tower atop Mt. St. Helena is threatened. Threats to domestic water supplies and hard infrastructure. Threats to natural resources and prehistoric and historic archeological sites. Prolonged drought conditions exist in the vegetation making fire control difficult. With current resources, efforts are being focused on structure defense and then perimeter control. Local economy has come to complete stop as the community is evacuated. 24 hours: Threats continue to the communities of Middletown, Hidden Valley Lake, Cobb Mtn, Berryessa Estates, Twin Lakes, The Geysers. In addition, the communication tower atop Mt. St. Helena is threatened. Threats to domestic water supplies and hard infrastructure. Threats to natural resources and prehistoric and historic archeological sites. Prolonged drought conditions exist in the vegetation making fire control difficult. With current resources, efforts are being focused on structure defense and then perimeter control. Local economy has come to complete stop as the community is evacuated. 48 hours: Threats continue to the communities of Middletown, Hidden Valley Lake, Cobb Mtn, Berryessa Estates, Twin Lakes, The Geysers, Aetna Springs. In addition, the communication tower atop Mt. St. Helena is threatened. Threats to domestic water supplies and hard infrastructure. Threats to natural resources and prehistoric and historic archeological sites. Prolonged drought conditions exist in the vegetation making fire control difficult. With current resources, efforts are being focused on structure defense and then perimeter control. Local economy has come to complete stop as the community is evacuated. 72 hours: Threats continue to the communities of Middletown, Hidden Valley Lake, Cobb Mtn, Berryessa Estates, Twin Lakes, The Geysers, Aetna Springs. In addition, the communication tower atop Mt. St. Helena is threatened. Threats to domestic water supplies and hard infrastructure. Threats to natural resources and prehistoric and historic archeological sites. Prolonged drought conditions exist in the vegetation making fire control difficult. With current resources, efforts are being focused on structure defense and then perimeter control. Local economy has come to complete stop as the community is evacuated. Anticipated after 72 hours: Threats continue to the communities of Middletown, Hidden Valley Lake, Cobb Mtn, Berryessa Estates, Twin Lakes, The Geysers. In addition, the communication tower atop Mt. St. Helena is threatened. Threats to domestic water supplies and hard infrastructure. Threats to natural resources and prehistoric and historic archeological sites. Prolonged drought conditions exist in the vegetation making fire control difficult. With current resources, efforts are being focused on structure defense and then perimeter control. Local economy has come to complete stop as the community is evacuated. 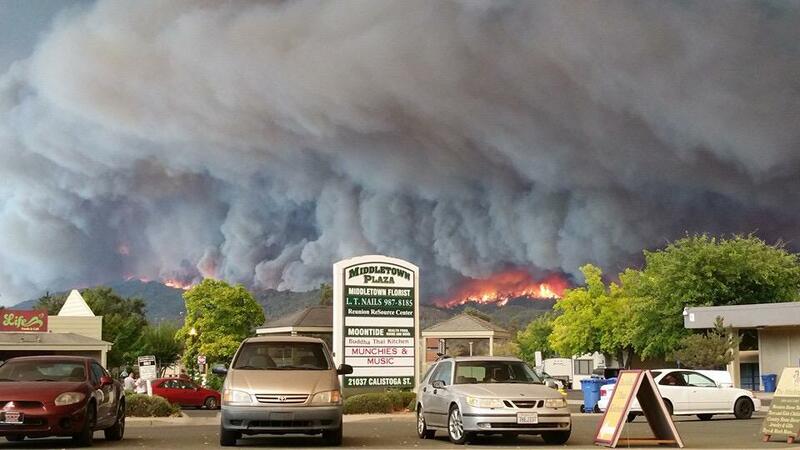 09/14/2015 1700: PM 209: 62,000 acres, 10% Containment, 585 homes Destroyed, 1795 Personnel Assigned. Wind: Slope/Valley becoming downslope 4-8 mph; Ridgetops SW 6-12 mph. Wind: Slope/Valley West 4-8 mph; Ridgetop West 6-12 mph¿Switching NW after 1800. Barbara McWilliams died in her #AndersonSprings home. From The Editors Mother: Hoberg's, where I met Bob[Editors father] in 1948 is gone. Only chimneys survived. The church at Loch Lomond is gone and I heard that Loch Lomond is gone too. I hear that my old house on Mapes Pass is gone. Margie Burnham McAuley's home in Gordon Springs survived and Gordon Springs adjoins Pine Grove. I don't know how much of Pine Grove is left. I heard that Hardester's grocery store and the small shopping center in Cobb were saved. Eyewitnesses say it is just devastating to see the damage. And, I think there are still some people missing. I hope the folks up in my old neighborhood got out. Photos Show Valley Fire Damage To Clothing-Optional Resort Harbin Hot SpringsThe ferocious Valley Fire reportedly torched the famed Harbin Hot Springs, a clothing-optional retreat center offering yoga and massage workshops in Middletown. 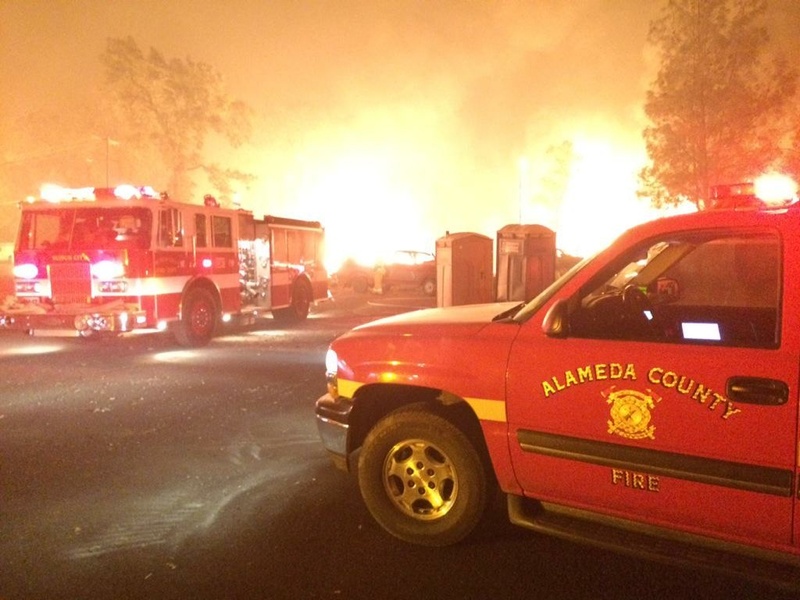 The Alameda Fire Department helps battle the Valley Fire. ALAMEDA FIRE DEPT. The 78-square-mile fire erupted Saturday afternoon and rapidly chewed through brush and trees parched from four years of drought. The California Department of Forestry and Fire Protection confirmed Sunday one fatality, In addition 400+ homes destroyed, officials also counted two apartment complexes and 10 businesses destroyed by the flames, department spokeswoman Lynn Valentine said. Four firefighters who are members of a helicopter crew suffered second-degree burns during the initial attack on the fire. They remained hospitalized in stable condition. 09/14/2015 1700: 62,000 acres, 10% contained. 09/14/2015 0700: 61,000 acres, 5% contained. Barbara McWilliams died in her #AndersonSprings home. 09/13/2015 1915: 50,000 acres, 0% contained. 09/13/2015 0700: 40,000 acres, 0% contained. Fire is still exhibiting extreme fire behavior. Communities that remain threatened are Middletown, Cobb and Hidden Valley. 09/12/2015 1905: 10,000 acres, 0% contained. Extreme fire behavior. Communities of Cob and Middletown threatened with evacuations in progress. CAL FIRE Team 3 is being mobilized to this incident. 09/12/2015: 250 acres, 0% contained. Fire is burning in grass and brush, northwest of Middletown with a moderate rate of spread. Structures are threatened. 09/12/2015: 200 acres, 0% contained running fire with long range spotting. Community of Cobb threatened, with evacuations in progress. 09/12/2015 1430: 50 acres burning in brush and timber with dangerous rate of spread. 0% contained. Fire is located northwest of Middletown. Structures are threatened. Video: A driver recorded harrowing video of his escape from the Valley Fire as it burned in Lake County's Anderson Springs on Saturday, Sept. 12, 2015. Update: Tenaya Fire (37 46.091 x 119 34.641 – Mariposa Co., 7200’ El. 8/7). This wildfire began on the afternoon of September 7, 2015, and is being suppressed. 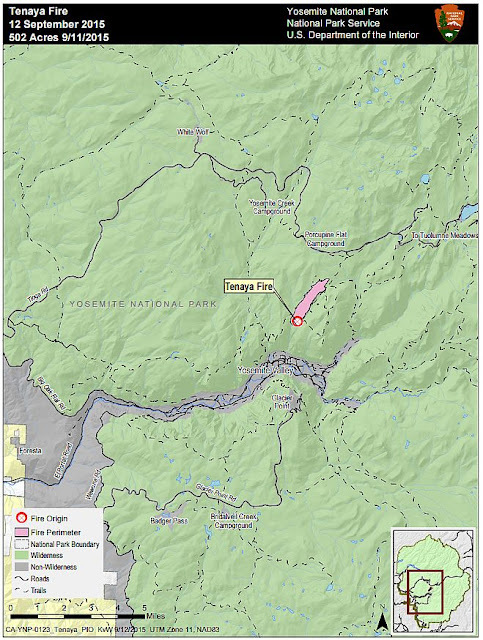 The fire is located along the Lehamite Creek Trail from the north rim of the Valley to the Tioga Road. The fire is at 415; the change is due to more accurate mapping by firefighters hiking the perimeter. Yosemite thanks all fire crews, engines, pilots and overhead who responded to the Tenaya Fire. Tenaya Fire (37 46.091 x 119 34.641 – Mariposa Co., 7200’ El. 8/7). This wildfire began on the afternoon of September 7, 2015, and is being suppressed. The fire is located along the Lehamite Creek Trail from the north rim of the Valley to the Tioga Road. The fire remains at 455 acres with 25% containment. The Incident Commander noted that firefighters continued to make progress on holding the perimeter line and putting out spot fires. Minimal fire spread is expected and line construction continues on the west flank. Crews have begun direct line construction across the head of the fire. The fire continues to flank across slopes, creep through surface fuels and the understory of trees. Single tree torching was also noted. Existing spot fires were mitigated and no new were found. The firefighter efforts at the heel or anchor point continue to hold as they make good progress along both flanks of the fire. Firefighter actions were able to reduce the need for air tanker operations. Although fire retardant has been employed in the suppression of the Tenaya Fire, firefighters are adhering to Minimum Impact Suppression Techniques (MIST). They are looking for opportunities to tie fire line into granite rock, trails, and other natural barriers with the least impacts to the environment, cultural and historical features. Snags (standing dead trees) which are safety hazards to firefighters by falling, are being preserved when possible. Yosemite Resource Advisors are assigned to the fire to assist firefighters. Firefighting resources assigned are adequate for accomplishing the objectives of the fire. Fire managers anticipate significant resource demobilization within the next few days. Assisting organizations and cooperators include the US Forest Service, Bureau of Land Management, and other National Park Service resources. There are 270 personnel committed to the fire. There has been one minor injury. There is no threat to structures. There is no estimated full containment and the cause is being investigated. Cathedral (37 51.078 x 119 25.120 – Tuolumne Co., 9400’El., 8/2). This is near the John Muir Trail to Cathedral Lakes. The perimeter is actively smoldering and creeping through lodgepole pine needles and logs and has good potential to grow until it hits natural barriers. The fire is 37 acres. Middle (37 51.538 x 119 41.194 - Tuolumne Co., 8043’El., 7/27). It is west of White Wolf and south of the Middle Tuolumne River. It is at 71 acres. Yosemite Fire Crew 1 and Saguaro Wildland Fire Module are assigned to this fire. 09/18/2015 0745: 70,760 Acres 60 % cont. 6,000 Single Residence homes remain threatened with 12 damaged by fire and 365 destroyed. Damage inspection teams will deploy today and continue the process of collecting information on damaged and destroyed structures. 09/17/2015 0745: 70,760 acres, 49% contained. Reduction in acreage due to better mapping intelligence. So far 252 residences confirmed destroyed. Damage inspection teams will deploy again today and continue the process of collecting information on damaged and destroyed structures. DINS reports there will be additional destroyed and damaged structures confirmed as they continue their survey. Structures Destroyed: 233 residences, 175 outbuildings, 15 structures damaged. 09/15/2015 1745: 71,780 acres, 40% contained. 6,000 Homes remained threatened, 233 destroyed. Mandatory evacuations in place for the communities of West Point, Mountain Ranch, Sheep Ranch and Railroad Ranch. Evacuation Advisories remain in affect. Road closures in affect on Hwy 26 from Hwy 49 to the Calaveras County line, portions of Mountain Ranch road, Hwy 49, Tabeau road and East Clinton road. Repopulating in all areas along Hwy 88 in Amador County. 09/15/2015 0745: 71,660 acres, 37% contained. 166 Homes destroyed. Mandatory evacuations in place for the communities of West Point, Mountain Ranch, Sheep Ranch and Railroad Ranch. 09/14/2015 1200: 71,063 Acres, CAL FIRE IMT-1, Butte AA requesting 1 VLAT, 2 LAT's and 2 S-2's to the incident. Neptune, Collson 131, and 912 so far) looks like all heading to the Butte. 72 hours: To be determined based off resource orders being filled and control lines being established and held. 09/13/2015 0600: 65,215 acres with 20% containment. 09/12/2015 1800: 65,000 acres, 15% 86 homes and 51 outbuildings destroyed. "Hot and dry weather coupled with fuel moisture at critical levels have resulted in extreme fire spread. Resources requested are arriving and being in implemented in the plan. Primary and secondary lines are being constructed and contingency planning continues." Fire currently threatens the Community of Robinson Mill and Feather Falls Commercial Timber, PG&E, & South Feather Water & Power. 09/14/2015 1800: 800 acres, 20% contained, Fire currently threatens the Community of Robinson Mill and Feather Falls Commercial Timber, PG&E, & South Featehr Water & Power. 09/14/2015 1420: 800 acres, 20% contained. The fire has spotted over the containment lines and is moving towards the southeast. Structures are threatened. 09/14/2015 0700: 525 acres, 25% contained. 09/13/2015 1915: 525 acres 25% contained. 09/12/2015 0630: 225 acres, 10% contained. Moderate fire behavior with long range spotting. 09/11/2015 1800: 125 acres, 10% contained. Structures remain threatened. 09/11/2015 1500: 50 acres, 0% contained, burning in brush and timber. Structures threatened. Fire is located on Lumpkin Road x Forbestown Road near Robinson Mills. Safety/Threat Remarks: High humidity and heat steep terain and rolling material.